Real Questions. Straight Answers. Stronger Faith. The Apologetics Study Bible will help today’s Christians better understand, defend, and proclaim their beliefs in this age of increasing moral and spiritual relativism. More than one-hundred key questions and articles placed throughout the volume about faith and science prompt a rewarding study experience at every reading. 2240 pages, from Broadman & Holman. 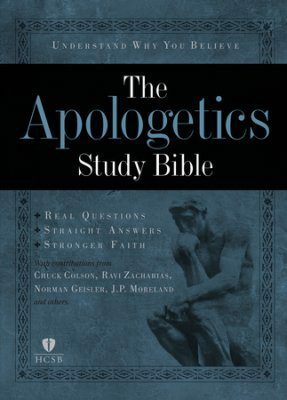 The Apologetics Study Bible features valuable contributions from a who’s-who of modern apologists such as Chuck Colson, Norm Geisler, Hank Hanegraaff, Josh McDowell, Albert Mohler, Ravi Zacharias, J. P. Moreland, and Phil Johnson.